Atlantis in a bag labeled for mission specialist Leland Melvin. February 11, 2008 — When Christopher Columbus left the shores of Spain in 1492, he sailed with the guidance of a compass as he sought a quicker route to the West via the east (unknowingly reaching the New World in the process). Five hundred years later, Columbus is still traveling with a compass, though the direction of discovery has changed. "We're trying to show the continuing voyage of discovery of the early explorers, symbolized by the ship and taking it from their path, from east to west when they were in their age of discovery, to our orbital path of discovery from the west to east," described astronaut Rex Walheim of his and his crew's mission insignia. "The shape kind of takes in the old compasses that show you directions; that was kind of a nice shape that hadn't been seen before [on a patch]." Walheim, together with fellow astronaut Stan Love, made a spacewalk today to outfit the European Space Agency's Columbus science lab, named for the Genoan explorer, in preparation for removing the module from shuttle Atlantis' payload bay to attach it to the International Space Station. 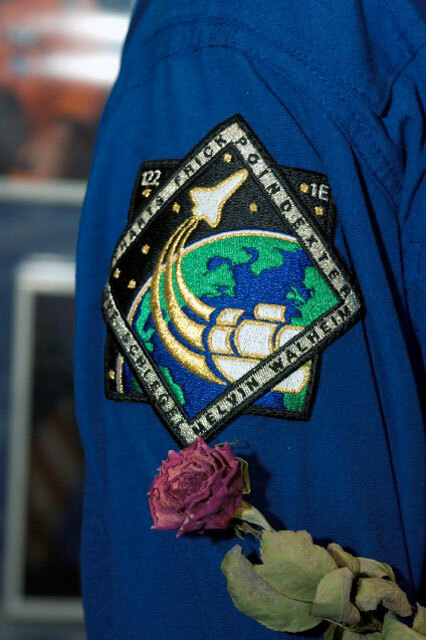 Both spacewalkers were wearing their mission's compass- shaped emblem, which Walheim's wife had designed. "My wife came up with the original design," Walheim told collectSPACE.com during a pre-flight interview. "She's a graphic designer by trade. She's a stay-at-home mom now but she designed the patch." "Designing for engineers is not the most pleasant activity, if you've the seen results of some of engineers' designs being artistic. So, I think it worked out well," he said with a smile. 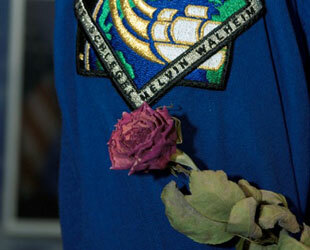 STS-122 spacewalker Rex Walheim holds a dried rose near his patch on his arm. He is flying the rose in the Official Flight Kit. Like the 15th century explorer, Walheim and his STS-122 crewmates launched their mission with a packed ship, as most of the shuttle's cargo capacity was taken by the 22.6 foot long by 14.7 foot wide Columbus lab, as well as their own supplies for the voyage. Still, the seven person crew had a small space in which to fly a few personal items for themselves and for others. For example, Walheim's brother Lance, a garden expert for Bayer Advanced, delivered him a dried rose that is named for and will be featured in the Tournament of Roses. It was originally planned to be part of the 2008 parade but as the mission was delayed by two months, it will be incorporated into Bayer's 2009 float. Walheim also chose some small mementos to fly. 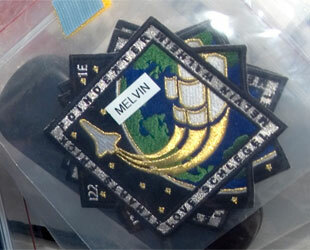 "I have packed some medallions of our crew patch," Walheim said of the items he packed for his family. "I have got a banner from my school, from the University of California that I will fly with me." Stan Love, who became Walheim's spacewalking partner after another crewman, Hans Schlegel fell ill, also packed items for his schools. "I'm flying a t-shirt with signatures for my high school, same thing for my graduate school. My college sent me some stuff to take. The University of Hawaii, where I worked for a year before I came [to NASA], is sending a meteorite because I worked in the meteorite group there. And so it's going to be the world's only meteorite to enter the atmosphere twice," Love told collectSPACE. As for Schlegel, who was reported to be feeling better and is expected to perform the flight's second spacewalk, he is flying items for his family and for home town in Germany. This is Schlegel's second mission, though he chose not to take anything from his first flight 15 years ago, "besides my spirit," he said. Schlegel's European crewmate, Leopold Eyharts, who was transferred to the space station's crew and will stay there until the next shuttle arrives to bring him home, also flew mementos for his home region in France but preferred not to share the details, yet. "I don't want to tell it actually, but you will probably know it when I am there [on the station]," he teased. "I have a few surprises for the people that I am bringing things for." "I am flying an item for each of my colleges that I went to, I'm flying some things for the Navy, a couple of religious organizations," shared Atlantis' pilot Alan 'Dex' Poindexter. All of the crew's items are packed into one of two different kits that are standard on every mission. 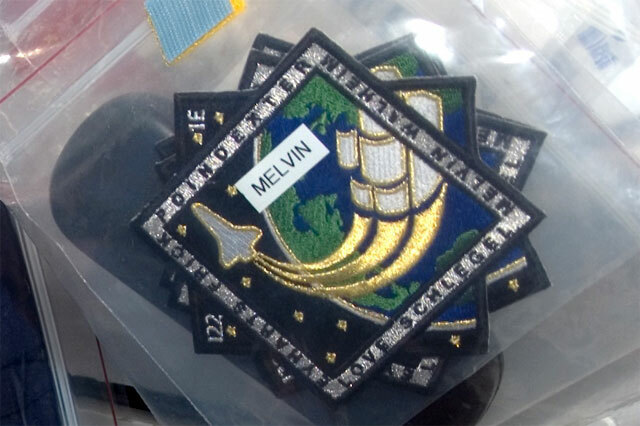 The astronauts' mementos for other individuals are packed within personal preference kits, separate for each crew member. Items for their schools and other organizations, together with items flown for NASA and its partners, are stored inside a single 2 cubic foot container, referred to as the Official Flight Kit. Among the thousands of mementos in the STS-122 OFK are two (deflated) footballs, one of which is packed for the alma matter of the only former NFL player among NASA's astronaut corps. "I'm taking up a couple of NFL jerseys, Detroit Lions and the Dallas Cowboys," said Leland Melvin, who had been a member of both teams before an injury forced his career change. "I am taking up Christian McBride's 'Live At Tonic,' his new album. I'm taking that up because I went to a concert a while back, met him and we talked." Melvin's also brought some of his own music. "I play piano and I try to compose some songs every now and then. I've recorded a few songs. At home I have a little studio where I record," he explained. "Everything that was on my computer, it's now on the space iPod so I will have some of my music and quite a few songs." Melvin is also taking a symbol of his inquisitiveness that led to his becoming an astronaut. "I am taking a Curious George t-shirt that a friend of mine gave me, because that's one of the books my mother read to me every day when I was a child, even before I could read. I always liked the fact that he was curious about life [as] that is something that I have always aspired to, being curious and staying focused on things that are out there," he said. Like Melvin, STS-122 mission commander Stephen Frick also thought of his childhood. "Sadly no lightsabers, STS-120 beat us to that punch. Certainly all of us are Star Wars fans from our early days, so we were excited to see that go up." 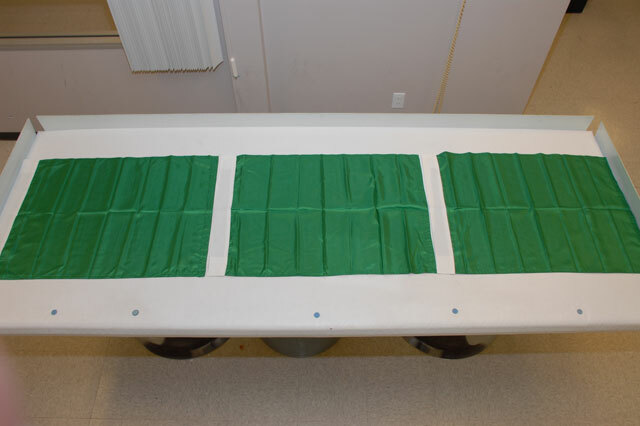 Instead, STS-122 is carrying three green race flags from the Daytona 500, which like NASA, is celebrating its 50th anniversary this year. Two of the flags will be returned to NASCAR after the mission lands. 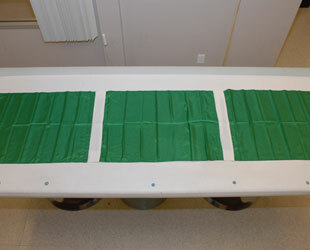 NASCAR's three Daytona 500 green race flags as photographed before they were packed aboard Atlantis for the STS-122 flight. The following is the STS-122 Official Flight Kit manifest, as provided by NASA. Inventory numbers that are missing indicate items that were removed prior to launch. Items 20 through 76 are manifested at the request of the STS-122 crewmembers. Items 77 through 80 are manifested at the request of the STS-122 payload customers.